Jones, S. C. (2009). Does presentation make a difference to risk perception: Testing different formats for communication of cancer risks. 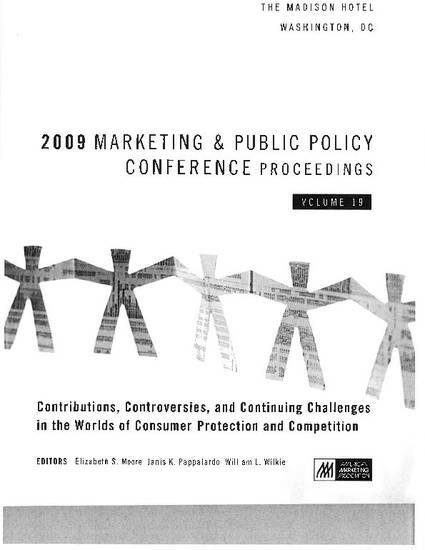 2009 Marketing & Public Policy Conference Proceedings (pp. 229-238). Washington: American Marketing Association. Evidence suggests that the presentation format of risk information can affect people’s perceptions of risk and influence health-related decisions. In these studies we investigated the impact of four different risk presentation formats: standard presentation, risk ladder, different base rates and visual representations on women’s perceptions of developing breast cancer of lymphoma. We found that the different presentations had virtually no impact on the participant’s risk estimates. Only in the second study relating to risk perceptions for lymphoma was there a significant difference between conditions for estimated 10-year-risk, with those in the ladder present condition reporting a lower estimated risk. The implications of these findings for future research on consumer risk perceptions are discussed.